Stars Amar'e Stoudemire, Carmelo Anthony and Tyson Chandler will all be on the floor in London Thursday when the Knicks play the Detroit Pistons. With broad but somewhat ambiguous implications, the statement has almost become something of a cliche. Bandied about throughout the years, its weight has lured free agents, enticed would-be sponsors and drawn increased interest from fans who flock to the World’s Most Famous Arena. But that statement has never been more true now — or at least since 1994, when that team last appeared in the N.B.A. Finals. 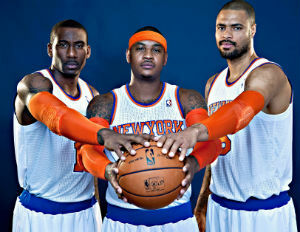 The New York Knicks take on the Detroit Pistons Thursday at the O2 Arena in southeast London on Thursday. For the first time in years, the Knicks are a team with a record worthy of its international presence and appeal, and whose stars bring an added level of currency for a league seeking to expand its product overseas. These Knicks lead the Atlantic division with a 24-13 record, with the same win total as the Miami Heat. Star forward Carmelo Anthony is having an MVP-caliber season. And despite a recent slide, the Knicks are in the running to get home court advantage throughout the playoffs — something few could have imagined this time last year. While the locals prefer soccer, cricket, rugby and even golf throughout the U.K., there’s wide interest in the N.B.A, if not the sport of basketball itself. That excitement is likely what drove tickets to sell out within four days, according to Ben Morel, senior vice president for NBA Europe. Fans in London got their last glance at Tyson Chandler and Carmelo Anthony last summer. The duo helped anchor the U.S. men’s basketball team’s front court during its gold medal run at the Olympic Games. Guard Iman Shumpert is expected to return for the first time after suffering a torn ACL last season. A finger injury will keep point guard Raymond Felton out of the game, but perhaps the Knicks’ biggest surprise has been the resurgent J.R. Smith; an early favorite for this year’s Most Improved Player award, Smith is averaging 17 points, five rebounds and three assists per game — all career-highs. For his part, Amar’e Stoudemire is keenly aware of the implications of the N.B.A. and individual players gaining exposure in Europe. In all, the league has played a total of 16 games in foreign markets. While the league was forced to abandon its plans last year because of the lockout-shortened season, the Nets and Raptors played two contests in March 2011; the Nets won the first game, 116-103, and the second, an epic 137-136 win in triple overtime. But still, it was the Nets and Raptors. “Because there’s no game during the regular season physically happening on the ground, it’s just something that gets the authenticity and real experience to our fans,” Morel told the Detroit Free Press. Even Spike Lee will be there, cheering on one of the best teams in the N.B.A.